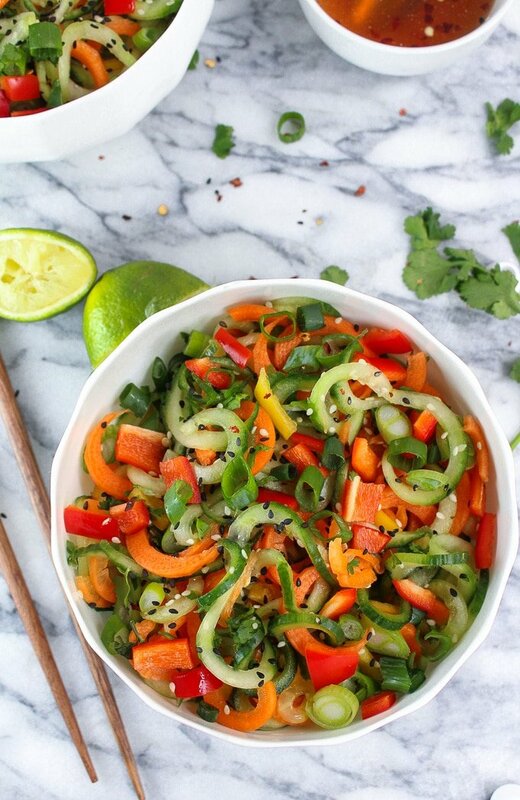 Asian Cucumber Sesame Salad: Bright flavours and crunchy textures! But first I’m serving up this salad with a side of #realtalk. I always go back and forth about how much of Mike’s health problems to share on my blog. On the one hand, the main reason I started this thing was to share his story in hopes that other people who are going through similar problems might be able to relate. Living with an invisible illness of any kind is a uniquely frustrating experience that I don’t feel like gets talked enough. And then on the other hand it feels like such a downer talking about his arthritic hands and creaky knees. Who wants to read about a 25 year old man with the aches and pains of a 55 year old man while searching for cookies? That being said, I think it’s important for myself to be open about Mike and his experience with Postural Orthostatic Tacychardia Syndrome (POTS) and Ehlers Danlos Syndrome (EDS). As I said before, I hope that in talking about some of the nastier details of living with these health issues that others might be able to relate. I also need to remind myself about why we choose to eat the way we do. While there are so many things that are outside of our control, food is not one of them. There are days…many, many days, when I would love nothing more than to throw some cheap frozen meal in the oven, serve up dinner and not think twice about it. In those times especially I need to remind myself why it’s so important to rally behind clean eating. We don’t have access to a physiotherapist with a thorough understanding of POTS, or one who understands how to build up strength in wonky knees. We also can’t take back years of undiagnosed arthritis that resulted in fused joints in his hand. We can however make an effort to eat clean and make an effort to nourish our bodies through our food. 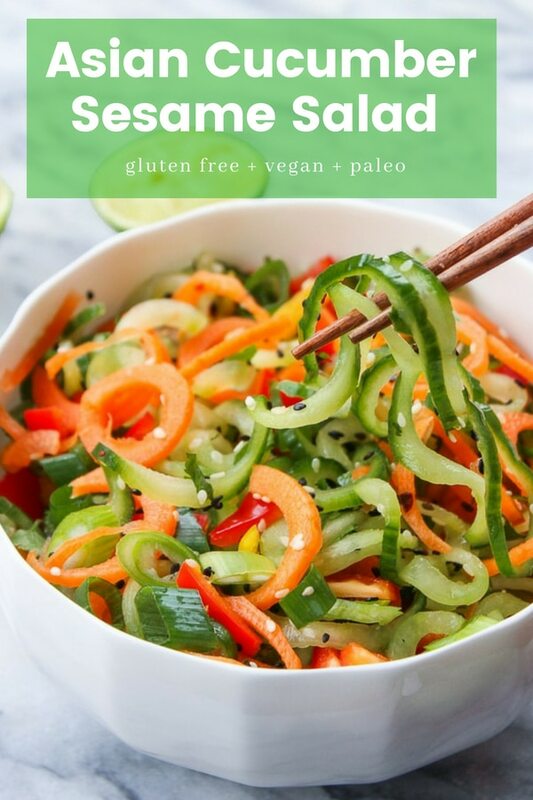 So not only is this Asian Cucumber Salad my nod to sunnier days and (hopefully) warmer weather, it’s also my salute to clean eating and my belief that health starts in the kitchen. This salad is the blend of salty and tangy flavors with bright colors and flavors. Between the carrots and the cucumber I’m loving the crunch you get in every bite. It’s been a couple months now and I’m still in love with my Spiralizer because I’ve been able to make sooo many fresh and healthy zoodle recipes like this one. If you don’t have a Spiralizer yet though you can still make this by using a julienne peeler in its place. So here’s to eating well and doing what we can for ourselves in the little ways that we can. Enjoy! Don’t forget to #asaucykitchen on instagram if you try this Asian Cucumber Sesame Salad! I love seeing what you make with! You can also post your pictures to our facebook page! Trim the ends of the cucumber and spiralize the cucumbers or use a julienne peeler. Place the sliced cucumbers in a colander and toss them with the 1 teaspoon of salt. Let the cucumbers sit in the colander in the sink for at least 5 minutes to draw out excess water/moisture.. 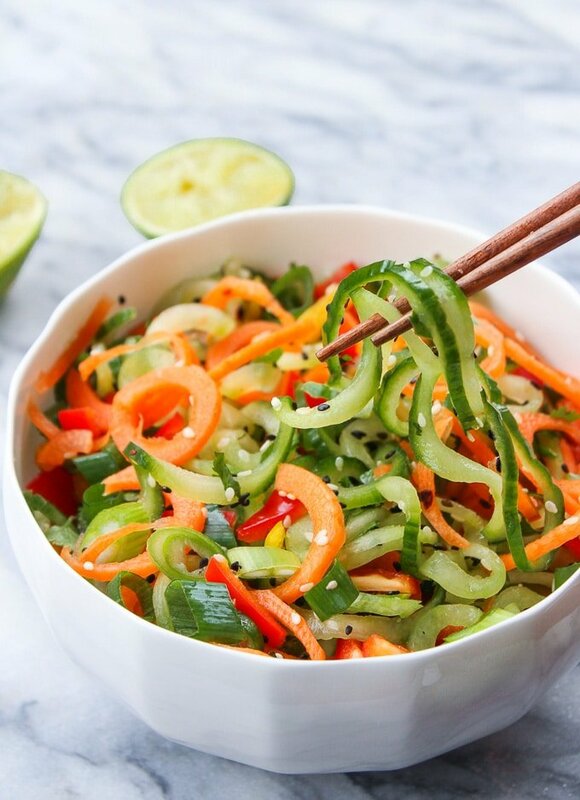 While the cucumber is sitting, spiralize or peel the carrots and chop the sweet peppers. You can also use this time to prepare the dressing. 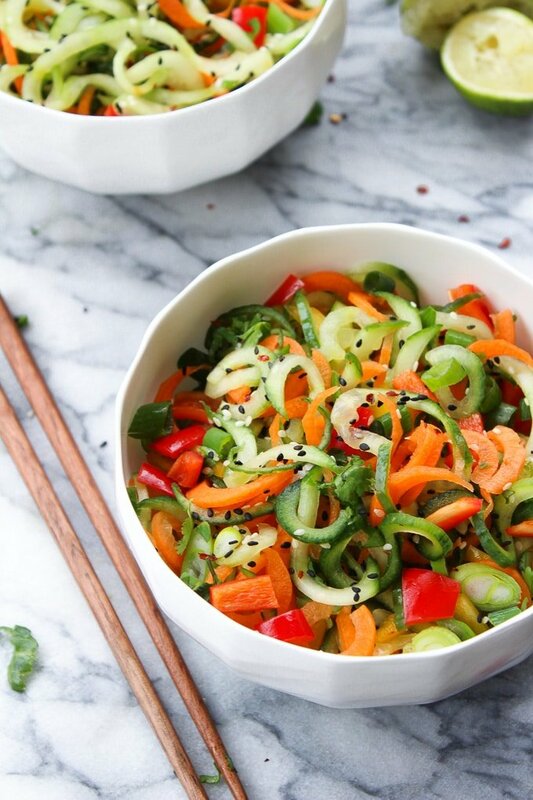 Place the cucumber noodles, carrots, and pepper in mixing bowl large enough to hold the salad. Add 2-3 tablespoons of the dressing and toss to combine, coating the salad. Top with the sliced green onion, sesame seeds, and cilantro and serve immediately. FYI this post contains affiliate links. I only post links for products I personally use and believe in. If you make a purchase on Amazon after clicking one of my links, I receive a small commission and the price you pay is not affected. Thank you! I think adding tofu to this would make a fabulous veg main dish! Hi Gretchen! Sorry about that – draining is definitely not the right word here. The reason you need to salt the cucumbers and then let them sit in a colander is so that the salt draws out excess moister/water. Cucumber has such a high water content that it can make for a very mushy salad. Will it make the salad salty? Also, curious what I can use instead of honey? In regards to the tofu – I guess it really just depends on how salted the tofu you’re adding is. That being said I doubt adding pre-salted tofu will make things too salty here. As for the honey you can always swap it out for a little bit of maple syrup or white cane sugar. 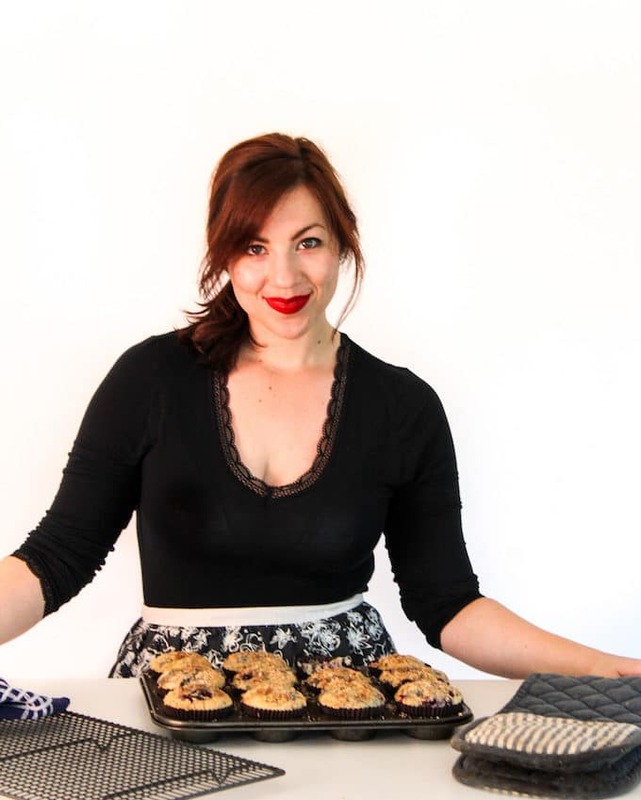 I came across your blog when I was researching Low Fodmap recipes on Pinterest. When I started reading this post and saw that your boyfriend(?) has EDS! I was just diagnosed with EDS last summer and it’s been a blessing and a curse. I know now where my pain comes from- but now I know I just have to live with it. Either way I’ll try and rally. Recently I’ve been having insane stomach issues and decided to try the Low fodmap diet to see if it would help my symptoms. Does Mike suffer from the same due to his EDS? No worries if it’s too personal, just looking for some peace of mind!! Hi Courtney! Not too personal at all! I’m always ready to help/talk about in case what we’ve gone through might be helpful to anyone else. I totally know what you mean about the diagnosis being both a blessing and a curse. It’s nice being able to put a name to a problem, but at the same time it’s not like there’s too much that you can actually do about any of it. Out of all of the health problems that Mike’s had EDS is definitely one of the more ambiguous ones. Have you ever been diagnosed with Celiac Disease/a gluten intolerance? It’s been a few years now since Mike was diagnosed with EDS and it’s incredible how many people I’ve met/talked to since then that have both EDS and problems with gluten (also POTS is one that comes up with those a lot). Not long after he was diagnosed with EDS we had an appointment with his gasteroenterologist who even mentioned the connection between patients he sees with EDS, POTS and Celiac Disease. He was a little reluctant to mention it because there wasn’t yet proof to back up the claim (both POTS & EDS are just recently getting more attention/diagnosis) but that’s what he noticed with his own patients. Even the ones who haven’t been diagnosed tend to do better after cutting it out from their diets. I just wanted to mention that in case you haven’t so you can talk about it with your doctor. I think since EDS affects connective tissue and collagen in the body it weakens the stomach lining which then leads to all kinds of IBS and inflammation in the body. It’s really hard to figure out with Mike which of his problems caused his other problems but I do think that the main thing to keep in mind is that his personal treatment is the same no matter what and that’s through his diet. There are some things relating to EDS that probably won’t be impacted too much through diet but if you’ve got problems with chronic fatigue and joint pain there’s a chance you might benefit from keep track of what you can eat. Low FODMAP is a really great place to start. It removes a lot of the more difficult to digest foods and gives your stomach a chance to heal/get stronger. Before Mike first started eating low FODMAP he was in constant pain. After the first day on the diet he started to feel a little better. I’ve also gotten a lot of emails from people with fatigue, chronic pain, brain fog etc who have said how much better they feel after eating low FODMAP for a time. After about 6-8 months eating low FODMAP Mike was able to reintroduce more foods back to plate. He can eat things like garlic/onions no problem now but we’ve been able to narrow down a few foods that cause his inflammation/arthritis pains to flare up. The hard things is that it is different for everyone. Everyone has different trigger foods – Mike struggles with too many nuts/eggs but someone else might have more issues with beans/dairy. I recommend keeping a food diary like this if you don’t already https://familydoctor.org/nutrition-keeping-a-food-diary/ It helps to be able to look back and find certain patters between what you eat/how you feel. Would trading zucchini for the cucumbers work? I pinned your delicious looking recipe a while ago and would now like to make it. I have a small question. You mention 2 whole cucumbers. Do you mean what we in UK call baby cucumbers? A standard British cucumber is normally about a foot long so I thought I would check first. Many thanks for your lovely recipes (I’m GF) which make eating a lot more of a pleasure and less of an obstacle course! Hi Bev! Good questions! If you’re using the really long cucumbers I’d just use 1 whole one. Hope you like it as much as we do! I absolutely love your Cucumber & Sesame Salad here. This salad was wonderful and refreshing on a hot day! Thanks! So glad you liked it! Thanks for coming back to leave a comment/rating! Love the clean flavors of Asian when combined with fresh food. Noodles, although delicious, can get heavy and too dominant in the recipe. I love that this is so fresh and delicious. Thank You! Thanks for sharing your story. My neice has EDS–so I feel for Mike! And this salad–incredible! This looks so delicious! I love cucumbers and the dressing sounds so tasty, Pinned & Yummed 🙂 Thank you for joining the Link-up, hope to “see you” again next week!! Hi Sarah! I love this salad and I’d like to include it in a round-up I’m doing for Buzzfeed. I’m trying to turn it around quickly so I’m just going to assume it’s ok but if it’s not you know where to find me. Just LMK. I’ve got no problem with that 🙂 Thanks for thinking of me – can’t wait to see the round up! So many fresh flavors and colorful veggies in on beauiful dish! This salad makes me crave summer so badly! Me too girl! I’m counting down the days to sunny weather! I get it. Thankfully, we can choose healthy foods and your salad is so pretty, Sarah. I want to dig in right now.